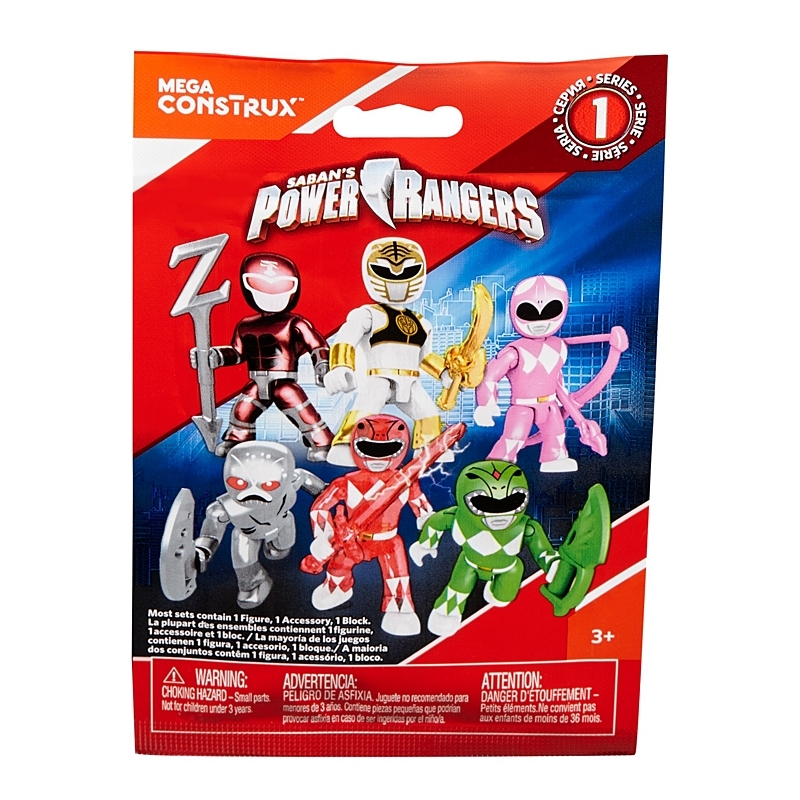 Mega Consrtux has released a line of Power Rangers building brick toys that are just fabulous. Before, as Mega Bloks, they released similar lines for the Power Rangers Samurai and Megaforce series. 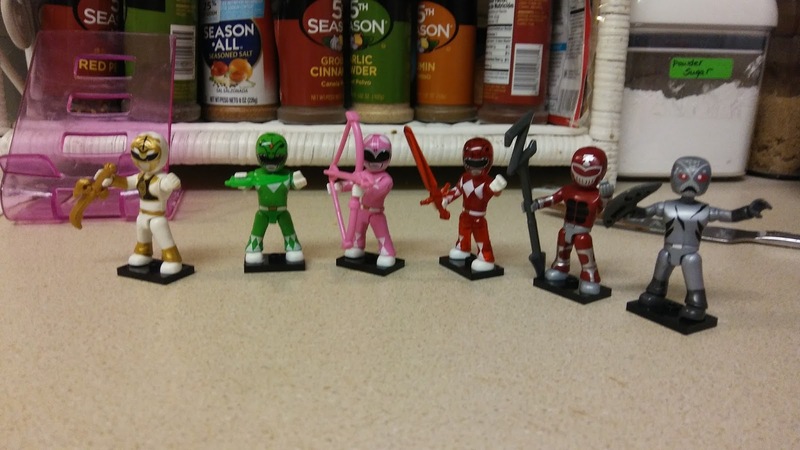 I enjoyed the blind bag mini figures from those lines, though doing a series based on the classic Mighty Morphin Power Rangers series is a solid way to sell me on your product. While I'm still on the fence about the building sets (I may get one or two), I am definitely all over the blind bags. In my first sighting earlier today at Toys R Us, I googled up the id codes and got the complete set. I'm hopeful the following series will fill out and complete the cast. In fact I may get a few more Putties to make a sizable patrol. Hopefully future series will also have Z Putties and Super Putties. The figures are pretty decent in their simple sculpts. I've done my best not to compare them to my beloved Imaginext Power Rangers (now those I plan to complete, just holding off on the rest of the Zords until I move this summer. They are huge. The entire line is wonderful). Probably because of their small size and charming nature. There are some notable things to point out. The Red Ranger is translucent. He's like this on the package, so I don't think I got a special version. I'd assume this is because a solid Red Ranger is included in a few of the building sets. That and judging by the codes, he was one of the more rare figures. So I figure the translucent plastic is the reward for him being harder to find. The shelf pack I was going through was pretty full and mine was the only red one I found. The Putty Patroller and Green Ranger seem to be the most common. Which works for army building a massive Putty Patrol if you want. I'll probably grab two more. Three figures is the usually case in troop building packs and works for me as a rule to go by. Green Ranger's dragon dagger seems to be a re-use of some other weapon mold. In fact, all of the weapons aside from Zedd's staff look like they could have been from another line. Mega Bloks has made plenty of fantasy themed sets, so I would imagine these weapon molds could be from those. Still, I posed Green Ranger like he was playing it as a flute. Somewhere the Dragonzord is responding I'm sure. The Pink Ranger's bow is almost bigger than her. It's a solid piece that she can hold, though it isn't exact. The tip is molded like it's on fire, which matches up to my mold re-use theory. Pink Ranger and Lord Zed seem to be the middle ground as far as difficulty in finding goes. There was just a couple in the shelf box. Speaking of Lord Zedd, he's a little silly. He doesn't have much detail and kinda looks like someone wearing one of those zip up character hoodies. His plastic is a darker red and looks a bit like one of those chocolate covered cherry M&Ms that they sell. His staff is great though. 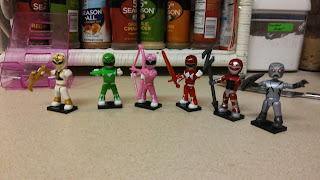 White Ranger, I figure, is either equal to Pink and Zedd, or just a little harder to get than Red. I only found the one I got, so I can't speak factually. The included checklist doesn't specify which ones are harder to find than others. The White Ranger comes with a rough estimate of his tiger scimitar, once again possible from another mold. I still posed him holding the sword upside down so he could consult with Saba. Like all Mega Bloks mini figures, the figures come with stands, which is extremely helpful. You can put them all over the place posed for battle or maybe posed for success. I suppose the Putty could be on his way to apply for a job. I hope at Panda Express. They never seem to have enough help when I go in. Turns out my kitchen has good lighting. Below is the list of codes I used when I found mine, allegedly there is another set of codes used on some bags, I have no clue, these are what worked for me. Feel free to copy them to a little note file on your phone so you don't have to play a guessing game when buying the figures. Unless you like that. That's fine, but if you want to use the codes they're on the back on the lower left corner in a black ink. Howdy! Someone in my Myspace group shared this site with us so I came to give it a look. I'm definitely enjoying the information. I'm bookmarking and will be tweeting this to my followers! Terrific blog and fantastic style and design.